I’m not a big sports fan, although I used to be one years ago. I didn’t watch any NFL games this year (maybe parts of a few), so I had no real history with either the Ravens (Black Birds?) or the 49ers (50 Minus 1’s?). I enjoyed the game, although I enjoyed the gathering more. Despite my lack of enthusiasm, I do tend to analyze the game, plays, teams, etc. and I did notice some unfortunate things in this game and, more generally, in the NFL. First of all, the Harbaugh brothers lived up to their reputation and put on a great game. The champion has been crowned (ringed? ), but this was anybody’s game and could have had much different results on a different day. It is interesting that John is now 2-0 against his younger brother, Jim, though. The unfortunate aspect of this game is that the officiating played a significant role in the outcome and it really taints the results when that happens. You can argue that there were offsetting calls made earlier in the game, but it’s harder to ignore the ones that happen as the game is concluding. 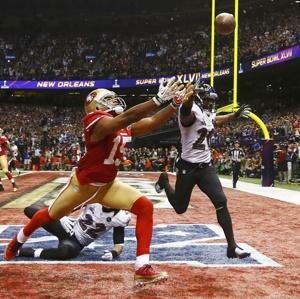 Jimmy Smith clearly got away with holding in the end zone on 4th and goal on the 49ers final drive. Compounding that was the blatant holding by several members of the punt team on the following drive, which allowed the Ravens to burn more time off of the clock. It was just adding insult to injury at that point. It seemed like the referees had made a decision that the game was over at that point and were not going to allow any more action. That’s really a shame. Still, you can’t be displeased with another close game in the Super Bowl after so many years of blowouts. It’s almost worth watching now. I hate to bring up another subject, but it’s even more disappointing that an overzealous league commissioner was able to ruin the season of one team and several players, while allowing others to get away with similar and worse infractions. It’s hard not to conclude that Goodell really had it out for Sean Peyton and the New Orleans Saints. I’ll just leave it at that and go back to other things that are more worthwhile than professional sports. Posted in Sports. Tagged NFL.